I found this cute stamped image (unknown manufacturer) in my stash and thought it would make a cute father's day card. Most dads work very hard and should take time to just stop and chill now and then, so this image reminded me of that fact. I colored the image with Copics, adding fruit punch stickles to the flower for a little sparkle. The MFT fishtail banners were die-cut with Melon Mambo and white cardstocks, and layered with 2 die-cut butterflies done with a (Retired) SU! butterfly framelit die. The sentiment is by SU! The mini sun was done with 2 dies - a Lil Inker small sun die, along with the center cut with a MB holly and leaves die and a snippet of bright orange cardstock. The clouds were done with a Lil Inker cloud die with Cool Caribbean and white cardstocks and I added some clear Wink of Stella to the white cloud. The inside was printed on my computer and says "wishing you a happy, peaceful and relaxing father's day." LOL! What a cute image!!! He really does look relaxed too. Love the blue and white cloud and that bright sunshine. The butterflies look great on this design too. Fabulous card Carol. A super card Carol, such a fun image - perfect for Father's Day. So cute and I am sure Dad will love it too. 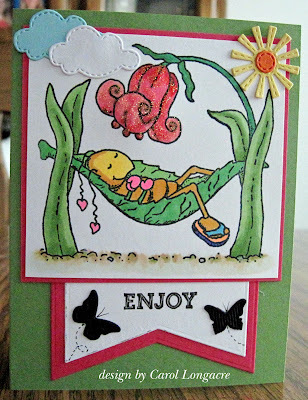 How fun and cute bug you choose for your card, Carol!! :D Delightful and sweet design and the sparkle on the flower looks great! Love the banner with the two butterflies, too! Well done! Hope your health it's going better! Hugs! AW! he is so colourful and relaxing, LOVE it. This is a darling card! A sweet reminder for dad to take it easy on a hot summer day. I'm so glad you linked up to the DRU "Sunshine / Clouds" challenge. Best of luck to you! So cute :) Thank you for playing along with us in the DIES R US challenge! OMG what a cute card! Thanks so much for playing in our ‘Sunshine or Clouds’ challenge at Dies R Us. Good Luck and please come back again soon!